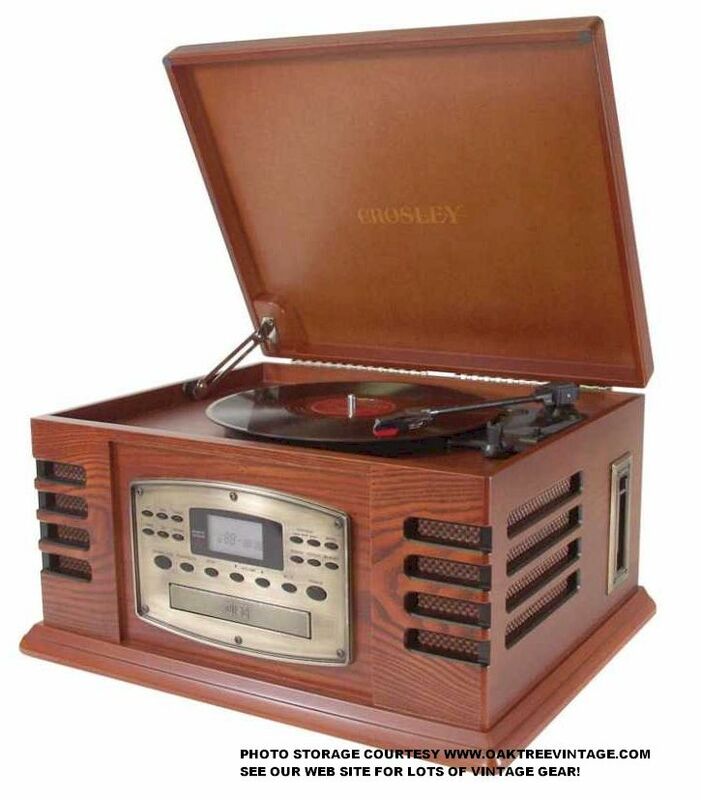 The Crosley units shown below have been discontinued and are no longer available. This page is maintained for archive photos and reference. The Fada "Bullet" is probably the most recognizable of all the Catalin radios ever made. 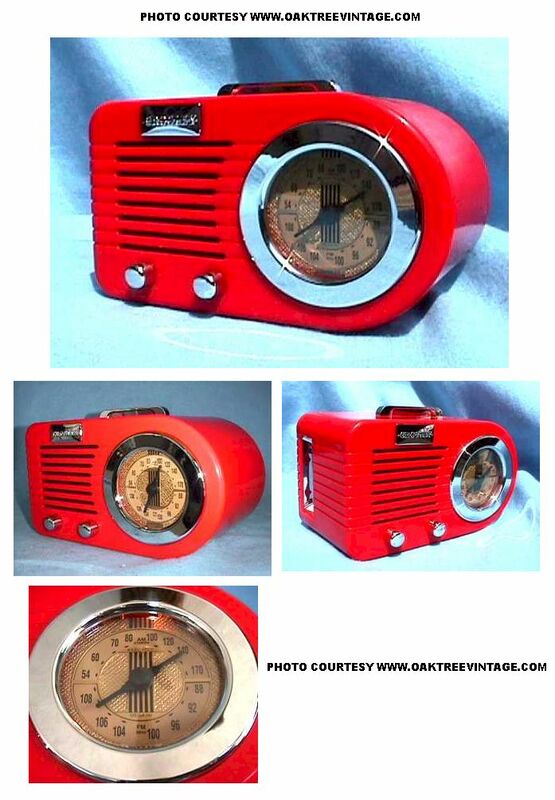 This is a great reproduction version made by the modern Crosley Company. 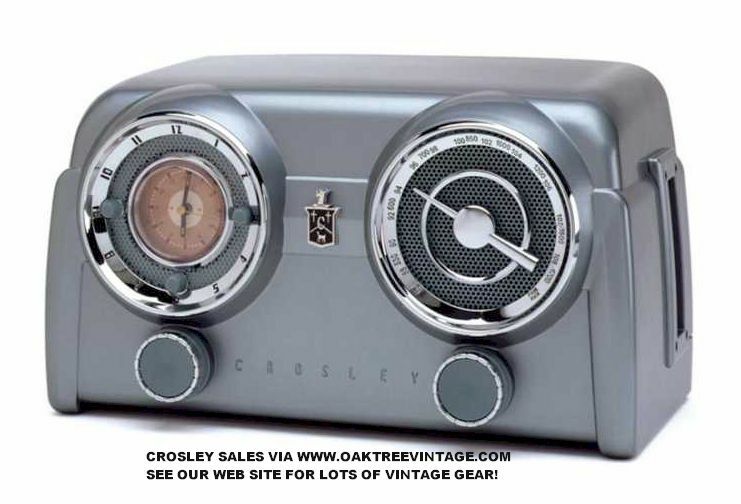 This is a Crosley CR-2 AM / FM / CASSETTE PLAYER-RADIO. 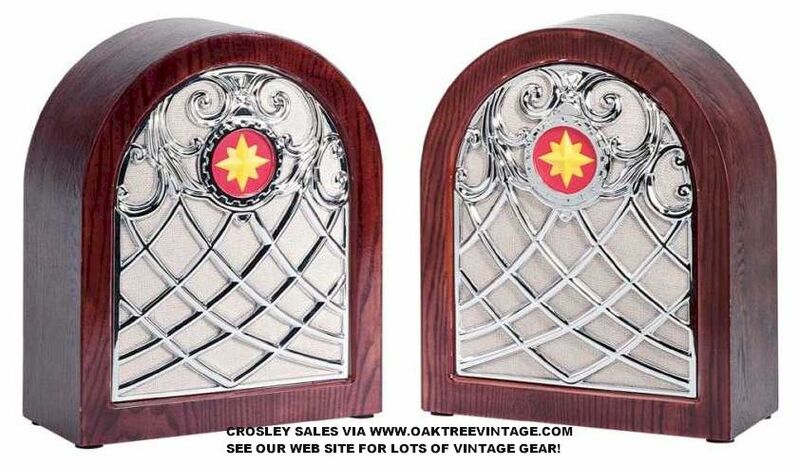 These like most Crosley radios made today, were limited in production. This model dates from 1988 and is no longer in production. Solid State, n tube! Very handsome, full size reproduction, unlike many of the miniature one's that have been made. Dark Chocolate, almost black, body with slightly off-white accents. 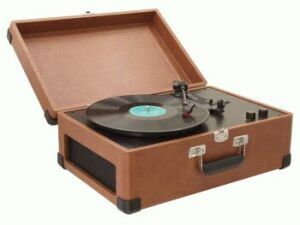 These are very faithful to the original designs with the exception of the Crosley badge and the Cassette sl in the end. No cracks, splits, or deep scratches. Only very minor wear. Dial window perfectly clear. Illuminated dial. Volume control and selector switch cleaned. Cassette transport cleaned, all rubber conditioned, head cleaned and demagnetized and all functions tested. This is a great way to own a classic Catalin design without spending the $1000-$4500. for an original version of this radio. Includes our 90 day warranty. 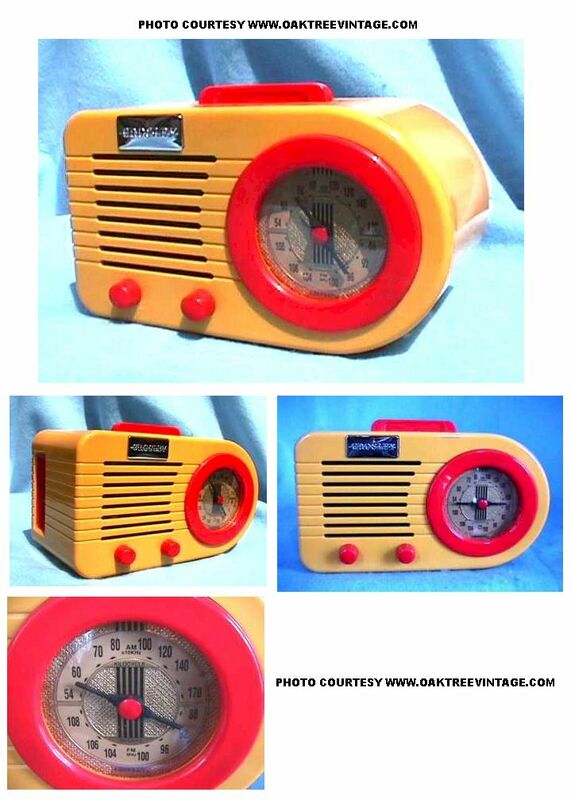 Produced in durable ABS plastic to replicate Bakelite material originally used in the 1940's, this radio is true to the original D2661 in every her way, from the prominent center front square dial to the horizontal side louvers and dual tuning knobs. It's also updated with AM/FM radio and cassette player. Available in Brown or Chrome. 90 Day limited warranty. UL listed. Dimensions 11"w x 7"h x 6"d 5 lbs unpacked. 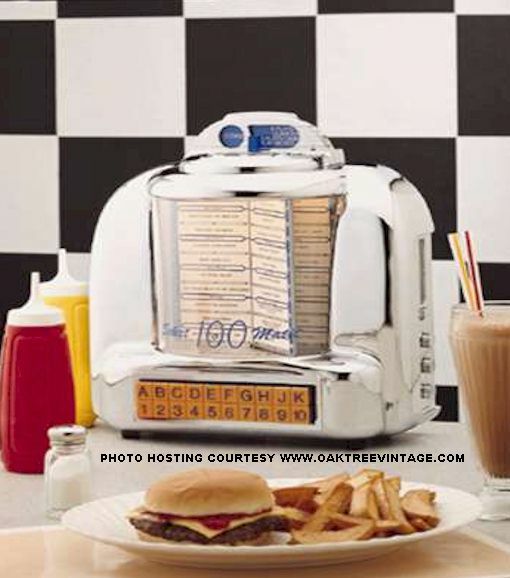 Roadside diners of America boasted countertop jukeboxes like the 1950's Select-O-Matic, which features a state of the art AM/FM radio with cassette player. The lighted song chart has pages that turn and the selection buttons conceal the dial scale. ABS chrome dipped cabinet (Chrome like the bumper of a '57 Chevy! ), high fidelity speaker, internal/external antennas, on/off switch controls panel lights. This model also has exceptional AM reception for picking up those distant ball games! 90 Day limited warranty. UL listed. Dimensions 12"w x 13"h x 5 1/4"d 8 lbs unpacked. 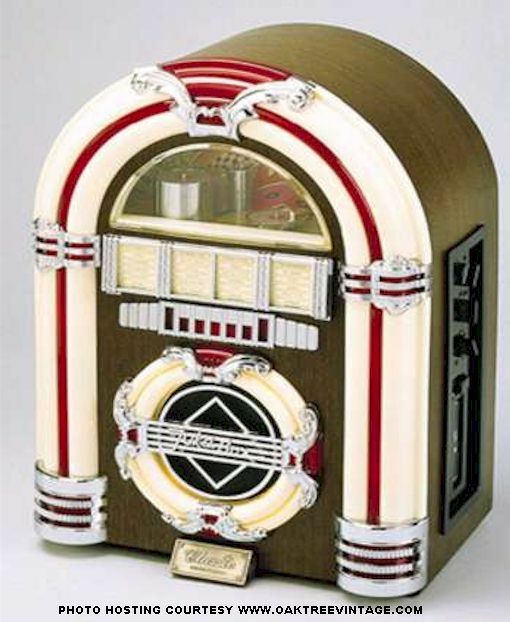 Get ready to Rock 'n' Roll and enjoy all kinds of music, not just the oldies, with this 1947 jukebox replica with CD. The song chart lifts to reveal the dial scale, and panel lights can be turned on or off. Vertical opening CD player is located on the front grill panel. Handcrafted wood and veneer cabinet with AM/FM radio and CD player, internal/external antennas, and full range dynamic speaker. 90 Days Limited Warranty. UL Listed. Dimensions 7.75" x 10.25" x 14.25" 12 lbs unpacked. 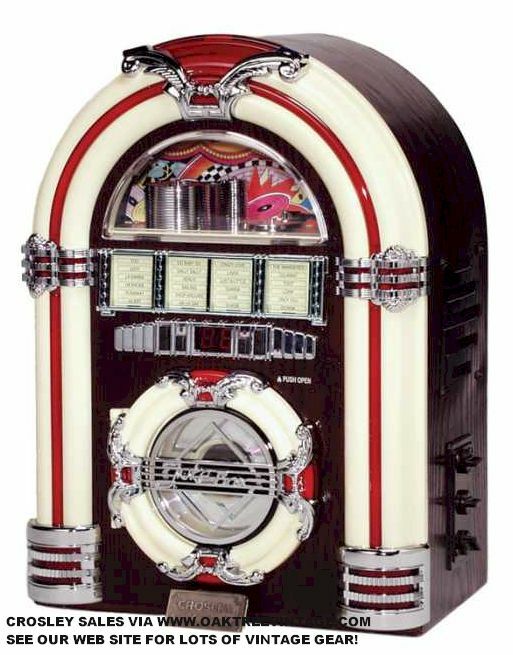 Get ready to rock 'n' roll and enjoy all kinds of music, not just the oldies, with this 1947 jukebox replica. The song chart lifts to reveal the dial scale, and panel lights can be turned on or off. Handcrafted wood and veneer cabinet with AM/FM radio and cassette player, internal/external antennas, and full-range dynamic speakers. 90 Day limited warranty. UL listed. Dimensions 10 1/4"w x 14 1/4"h x 7 1/4" d 8 lbs unpacked. 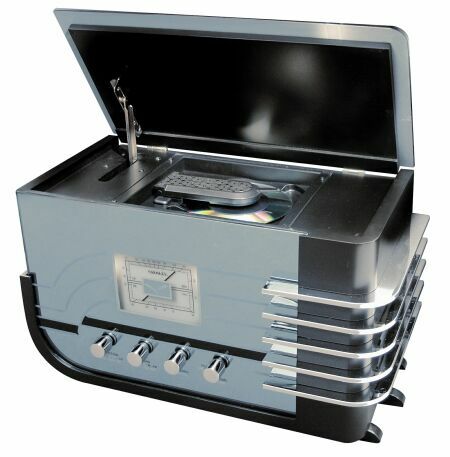 This Crosley 2/3 scale CD Jukebox is the finest replica of the most famous jukebox ever produced, the Wurlitzer 1015. Updated for our times, this jukebox features a state-of-the-art Sanyo 10 compact disc changer, an AM/FM radio, a full function reme control and a 42-disc storage base. 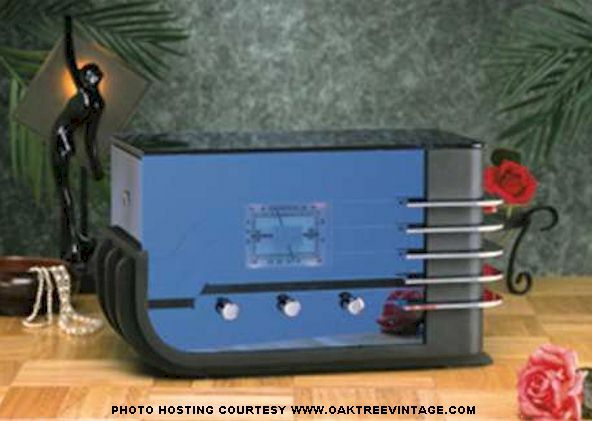 The Crosley Jukebox is also equipped with 4 speakers and 4 transformers and appropriately thermostatically controlled to keep the internal components cool for hours of endless enjoyment. Each unit is individually checked and tested extensively to meet the highest standards of quality workmanship and UL listed. There are just some things that were meant to be timeless. 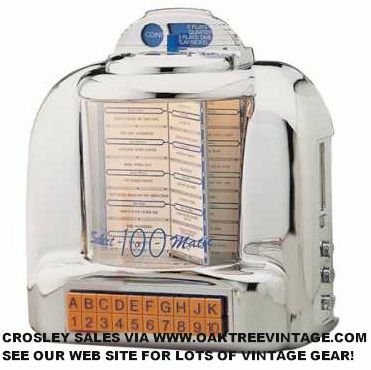 The jukebox is one of these items that indeed transcend time and so is the Crosley name. 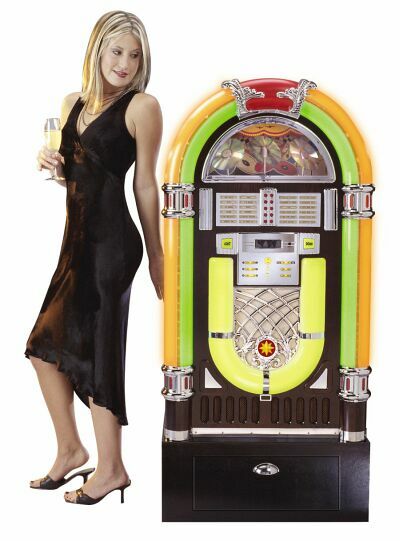 To many, a jukebox is a way to let the "good times roll" and is sure to add a little flare to any room. Well, Crosley has found a way to truly "knock your socks off" with our MP3 Jukebox. 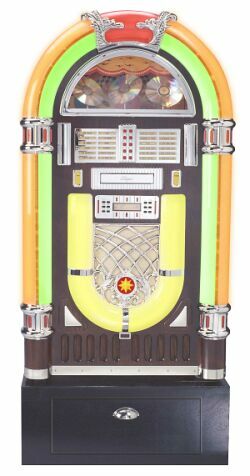 No matter what technology advancements are made throughout the years the jukebox has become a "good-times" staple in most American families. 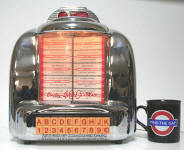 By marrying the technology of today with the looks of yesteryear our MP3 Jukebox is sure to amaze. Our jukebox comes complete with AM/FM Radio, Digital Tuner, and a CD Player that also reads MP3 and WAV Digital File Formats. What more could anyone want? The color shifting LED accent lights will put the cherry on top of anyone's h fudge sundae. The ST12 stand with a storage area in the base for your CD's and accessories. The stand ships in a separate carton. Longing to combine the quality audio craftsmanship of yesteryear with the superior sound and convenience of today's compact disc technology? Look no further! 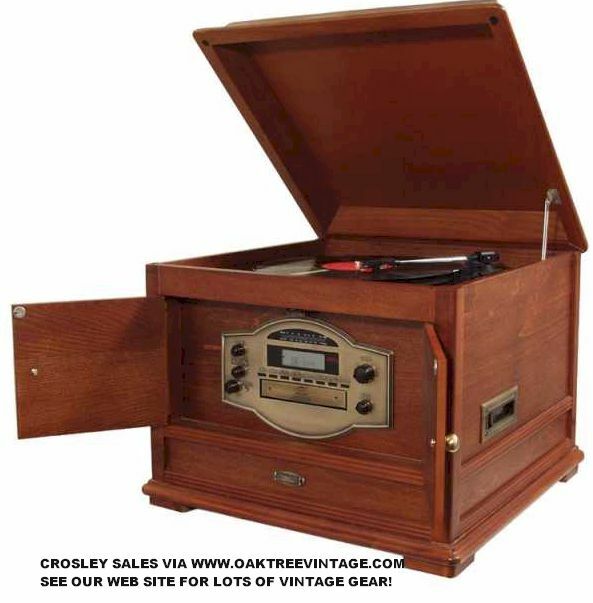 Now you can enjoy your CD collection on an authentic Crosley detailed radio reproduction. The CR-19-CD Metro features handcrafted wood and veneer construction, in addition to the little touches that make this radio the perfect accent for any home or office: illuminated airplane dial scale, hand-woven grill clh, brass hardware, and smoh hand-rubbed finish. 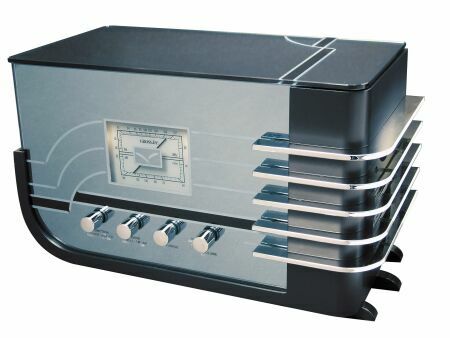 The AM/FM stereo radio with Automatic Frequency Control features bh internal and external antennas. Bh AM & FM bands are exceptionally strong in receiving for pulling those distant ball games! The fully programmable CD player hidden under the hinged top, offers digital display, repeat, track skip and a pause feature. Also features a stereo pair of RCA type AUX input jacks for use with anher device such as a tape deck or turntable (turntable input would require a cartridge pre-amp inserted between the two). Complimented with two 4" full-range True Stereo speakers, this piece is one that young and old will enjoy for years to come. Available in Paprika finish. 90 Day limited warranty. UL listed. Dimensions 10"h closed (16" h open) x 16"w x 9"d unpacked, 19" x 14" x 12" and 15 lbs packed. The distinctive skyscraper design was prevalent during the Art Deco period. This 1933 replica features the same solid wood and veneer construction and an illuminated dial scale as originally produced. Electronics now include an AM/FM radio and cassette player with fast forward. 90 Day limited warranty. UL listed. Dimensions 10 1/4"w x 14"h x 7 1/4"d 6 lbs unpacked. Tweed covered portable AM-FM radio. What a great addition to the rec room, Den, bedroom or office. It's so simple to operate. Forget the complicated systems of recent vintage. Crosleys' standard 90 day limited warranty. 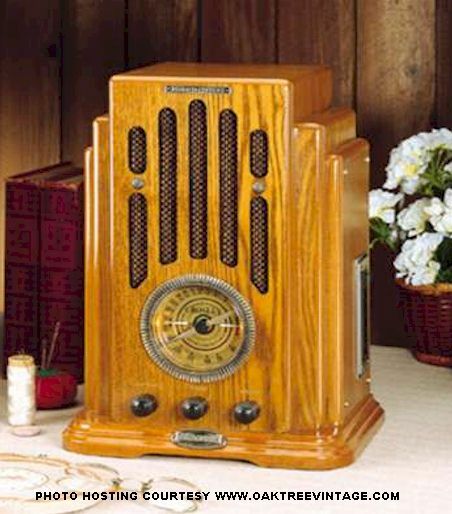 The Cathedral radio introduced in 1932 is one of the most recognized designs of all antique radios. This classic replica is re-created in handcrafted wood Oak finish veneer with a fully illuminated dial scale, authentic woven grill clh, and a BIG SOUNDING full range speaker with an analog AM/FM tuner and cassette player. Volume, Tone and Automatic Frequency Control top of the package. 90 Day limited warranty. UL listed. Dimensions 11.5"w x 13"h x 8"d 6 lbs unpacked / 15" x 10" x 15" and 8 lbs packed. 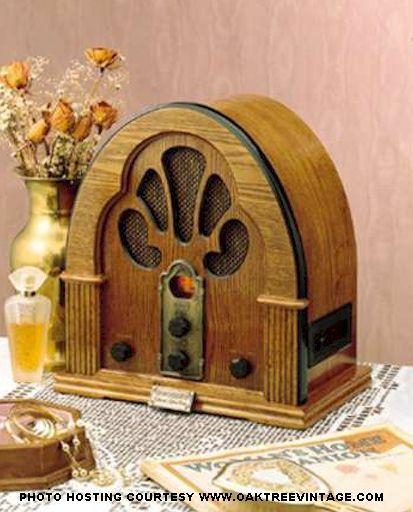 Console radios grew in popularity in the mid-thirties. The 1935 Cathedral console combines the classic shape of the popular cathedral and the practicality of a table base. The cabinet features an intricately carved grill highlighted by a large round aircraft style-tuning dial. The table base features a handy storage drawer and lower shelf. AM/FM radio with cassette player. 90 Day limited warranty. UL listed. Dimensions 12"w x 39 3/4"h x 10 1/2"d 12 lbs unpacked. Sparton "Blue-Bird" radio. Designed, engineered and crafted by hand. Hardwood case permits the ultimate resonance in AM or FM reception with AFC. Real glass, blue mirror slants back dramatically as originally inspired in 1935. AM/FM radio with cassette player. Here's something I discovered when I received the unit I had ordered for myself. I assumed the mirrors would be plastic given the price. It's REAL GLASS!!! Dimensions 14"h x 14"w x 7.5"d 11 lbs unpacked. Photos do n do this radio justice. It's beautiful and very impressive in real life! Much larger than we expected! 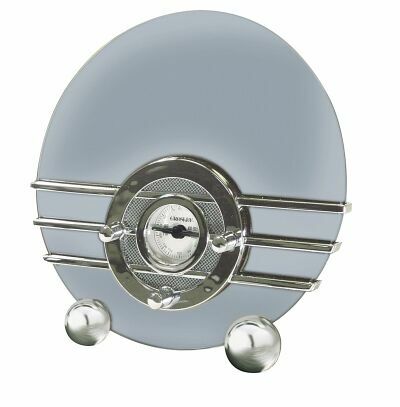 This unique mirrored glass table-top radio epitomized the art deco era. 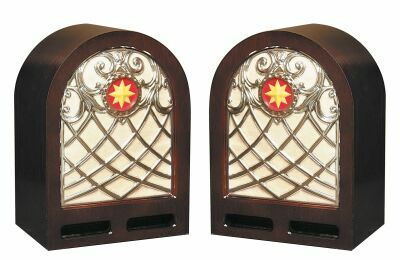 The bold artistry and craftsmanship provided eye catching appeal, yet served to accentuate the superb functionality and engineering of this one-of-a-kind radio-typical of products of this period. The Crosley Sleigh is a faithful reproduction of the Deluxe Model first manufactured in 1936 which featured elaborate etching on the glass cabinet and a rectangular illuminating dial scale. Accentuating the design are five wrap-around chrome bars and three attractive chrome control knobs. 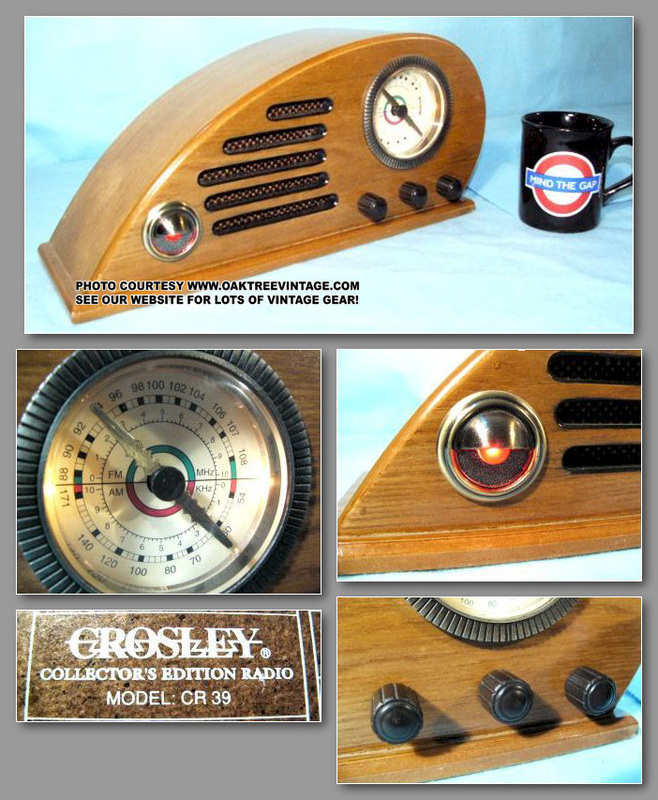 A perfect accent piece for the home or office, the Crosley Sleigh is a must addition to any radio collection. Includes modern day electronics, an AM/FM radio and a CD player. Dimensions 10.25"h x 17.5"w x 8.5"d unpacked and weighs 19 lbs packed. We can't say enough about this radio. 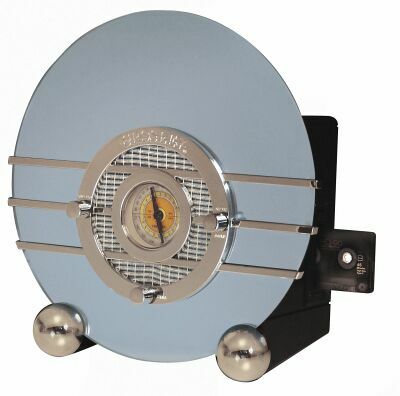 This unique "STEEL-BLUE MIRROR" glass table-top radio epitomized the art deco era. 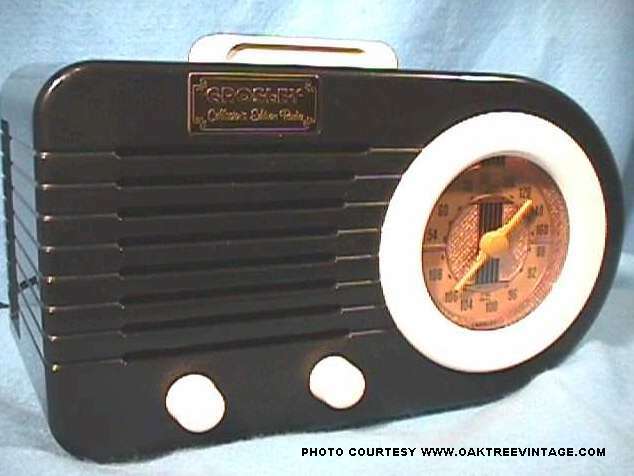 The bold artistry and craftsmanship provided eye catching appeal, yet served to accentuate the superb functionality and engineering of this one-of-a-kind radio-typical of products of this period. 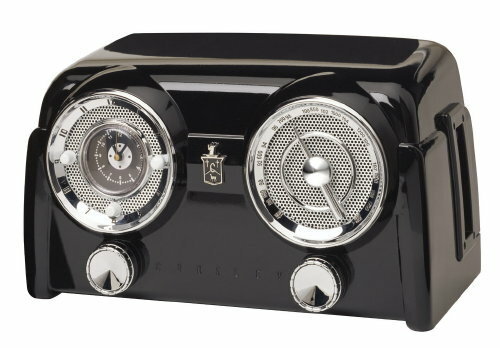 This is the 4-button deluxe model, n the 3-button you commonly see on the web, that is an exceptional reproduction of the Sparton 558 "Sleigh" Model radio, designed by Walter Dorwin Teague, circa 1936, which featured elaborate etching on the glass cabinet and a rectangular illuminating dial scale. Accentuating the design are five wrap-around chrome bars and three attractive chrome control knobs. 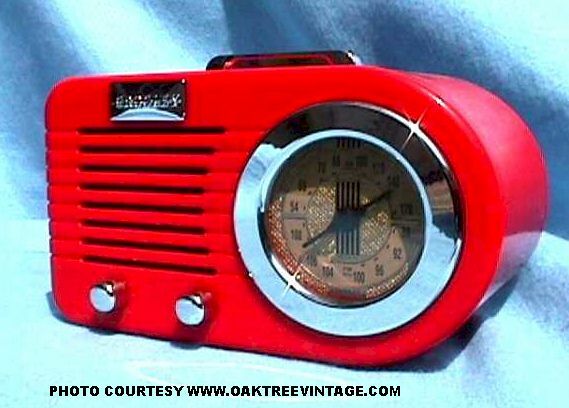 A perfect accent piece for the home or office, the Crosley Sleigh is a must addition to any radio collection. Includes modern day electronics, an AM/FM radio and a CD player. It's also STEREO! Here's a really COOL feature of this unit. The CD player is under the mirrored top which raises via a mor driven hinge that is activated via a chrome button on the side of the unit. It raises slowly with a very "Technical / mechanical" sound. (I thought it was cool anyway). Here's anher thing I discovered when I received the unit I had ordered for myself. I assumed the mirrors would be plastic given the price. Unit also features a pair of RCA inputs for connecting an additional piece of gear such as turntable, MP3 Player, Tape deck or any her analog line out signal. Dimensions 10.25"h x 17.5"w x 8.5"d unpacked and weighs 19 lbs packed. BEST LOOKING RADIO OUT THERE! We can't say enough about this radio. 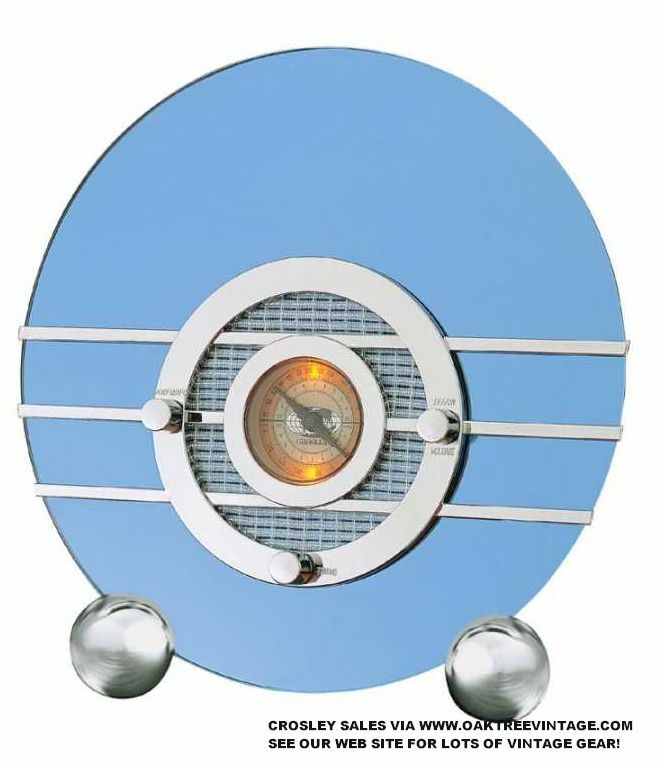 This unique "BLUE MIRROR" glass table-top radio epitomized the art deco era. 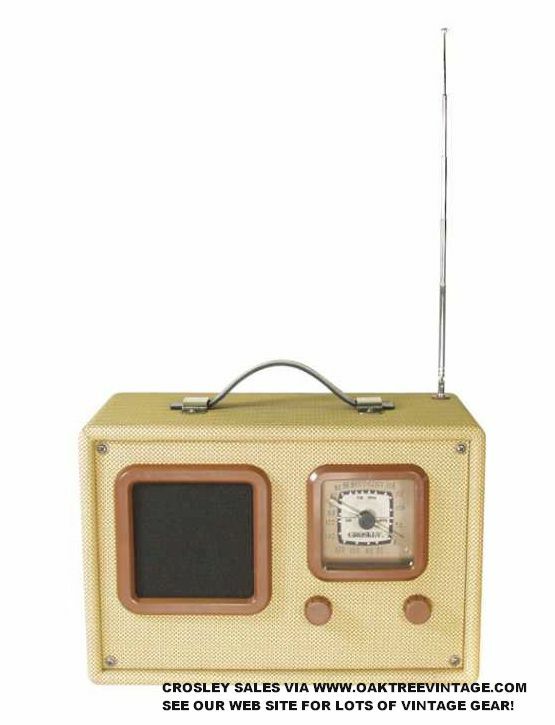 The bold artistry and craftsmanship provided eye catching appeal, yet served to accentuate the superb functionality and engineering of this one-of-a-kind radio-typical of products of this period. 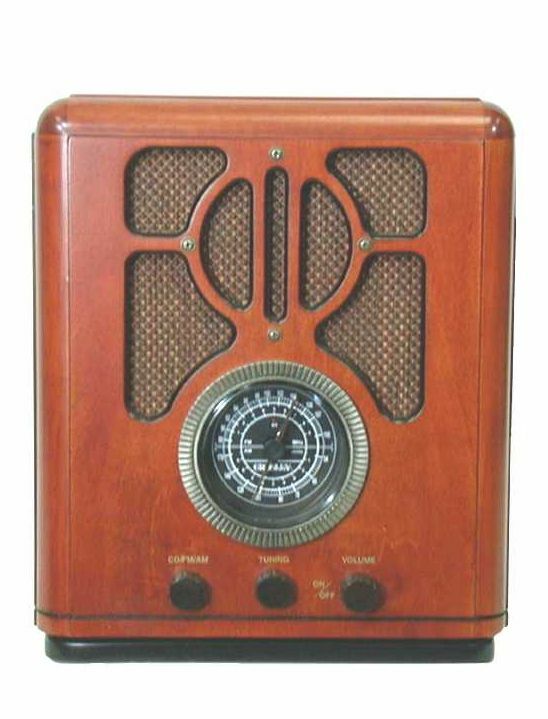 This is the 4-button deluxe model, n the 3-button you commonly see on the web, that is an exceptional reproduction of the Sparton 558 "Sleigh" Model radio, designed by Walter Dorwin Teague, circa 1936, which featured elaborate etching on the glass cabinet and a rectangular illuminating dial scale. Accentuating the design are five wrap-around chrome bars and three attractive chrome control knobs. 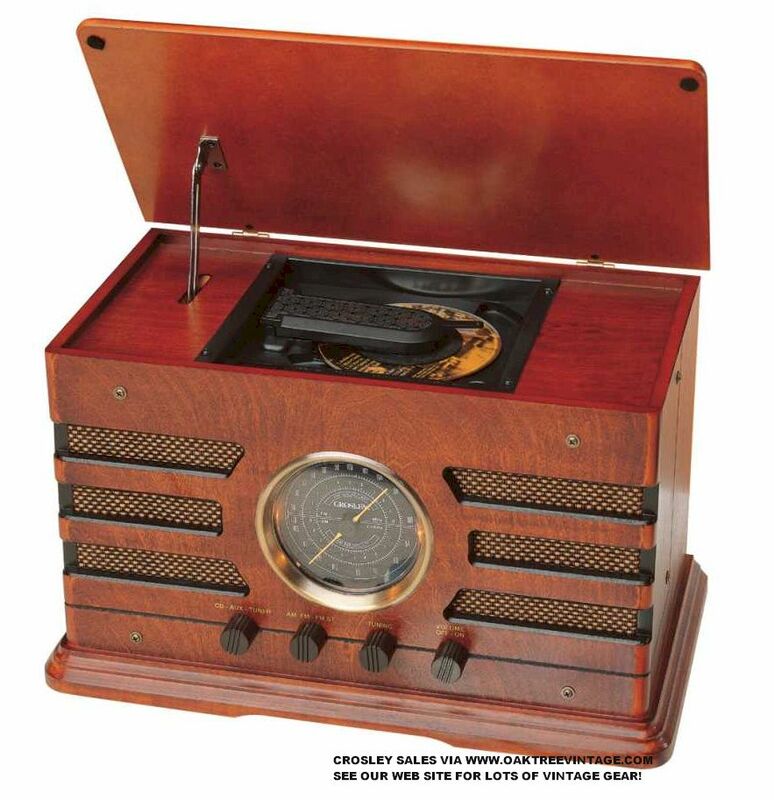 A perfect accent piece for the home or office, the Crosley Sleigh is a must addition to any radio collection. Includes modern day electronics, an AM/FM radio and a CD player. It's also STEREO! Here's a really COOL feature of this unit. The CD player is under the mirrored top which raises via a mor driven hinge that is activated via a chrome button on the side of the unit. It raises slowly with a very "Technical / mechanical" sound. (I thought it was cool anyway). Here's anher thing I discovered when I received the unit I had ordered for myself. I assumed the mirrors would be plastic given the price. This unit has the 1940's look of simplicity with its 4 line design and "Octagonal" shape throughout the cabinet. Very practical and simple to operate record in a cute "Vintage" style real wood cabinet that comes in your choice of medium Oak or Cherry wood finish. 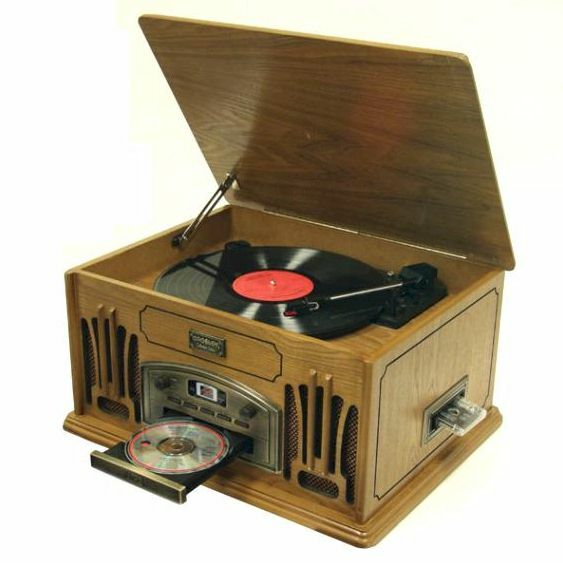 The top is hinged to reveal a turntable that plays 45, 33 1/3 and those old 78 RPM records and features Auto-Stop. A great way to listen to all those old albums and 45's without the complication of a component system. Built-in amp and speakers eliminate the need for anything extra! Comes with cartridge and needle installed. UL listed for safety and comes with Crosleys' standard 90 day limited warranty! Weighs 18 lbs packed. Optional record player stands a few rows down for this model. 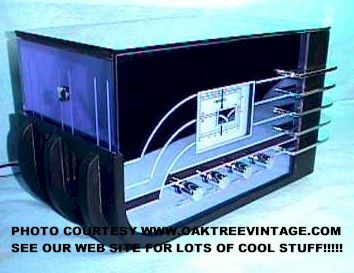 Very practical and simple to operate record in a cute "Vintage" style real wood cabinet that comes in your choice of medium Oak wood finish. 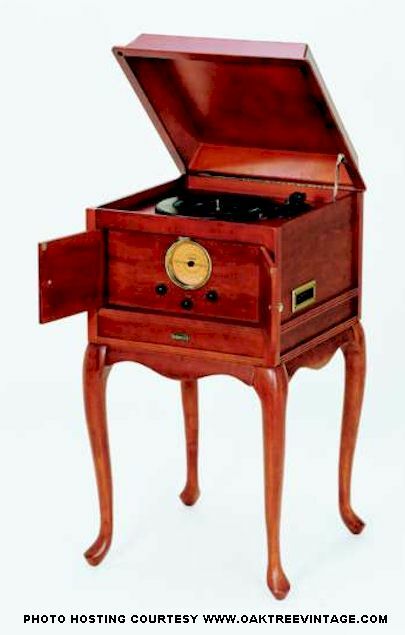 The top is hinged to reveal a turntable that plays 45, 33 1/3 and those old 78 RPM records and features Auto-Stop. A great way to listen to all those old albums and 45's without the complication of a component system. Built-in amp and speakers eliminate the need for anything extra! Comes with cartridge and needle installed. UL listed for safety and comes with Crosleys' standard 90 day limited warranty! Measures 17.5" w x 7" h x 14.25" deep Weighs 21 lbs packed. 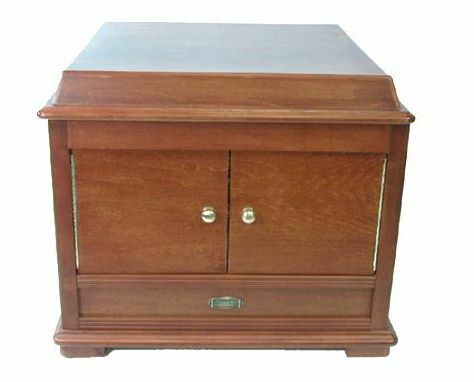 Very practical and simple to operate record in a cute "Vintage" style real wood cabinet that comes in your choice of medium Oak or Cherry wood finish. 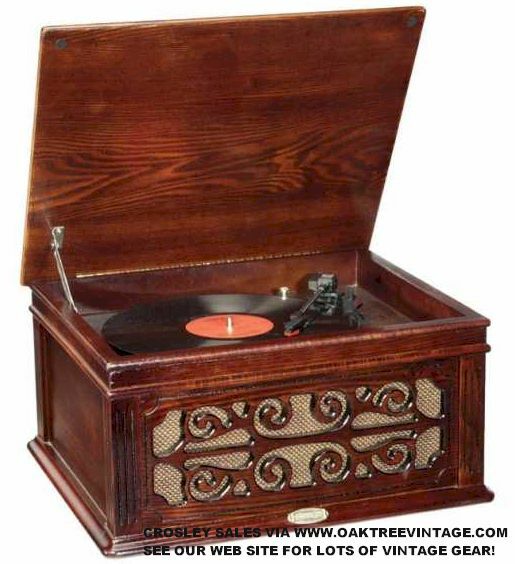 The top is hinged to reveal a turntable that plays 45, 33 1/3 and those old 78 RPM records and features Auto-Stop. A great way to listen to all those old albums and 45's without the complication of a component system. Built-in amp and speakers eliminate the need for anything extra! Comes with cartridge and needle installed. UL listed for safety and comes with Crosleys' standard 90 day limited warranty! Weighs 22 lbs packed. 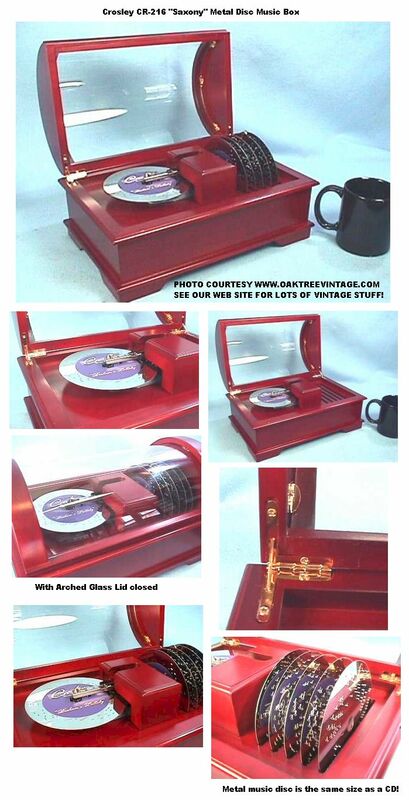 Tweed style vinyl covered record player / Phonograph. Suitcase model whose top is hinged to a turntable that plays 45, 33 1/3 and those old 78 RPM records and features auto-stop with "heavy-duty travel hardware". Comes with cartridge and needle installed. What a great addition to the rec room, Den, kids bedroom or office. It's so simple to operate. Forget the complicated systems of recent vintage. UL listed for safety and includes Crosleys' standard 90 day limited warranty. Measures 17" x 7" x 11" and weighs 15 lbs unpacked. 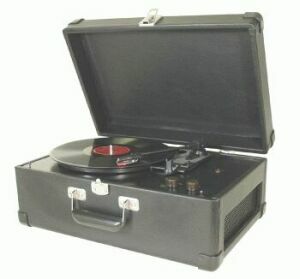 Vintage look vinyl covered record player / Phonograph. Suitcase model whose top is hinged to a turntable that plays 45, 33 1/3 and those old 78 RPM records and features auto-stop with "heavy-duty travel hardware". Comes with cartridge and needle installed. What a great addition to the rec room, Den, kids bedroom or office. It's so simple to operate. Forget the complicated systems of recent vintage. UL listed for safety and includes Crosleys' standard 90 day limited warranty. Measures 17" x 7" x 11" and weighs 15 lbs unpacked. 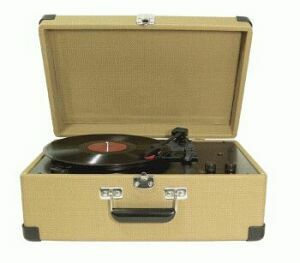 Tweed style vinyl covered record player & AM-FM radio. Suitcase model whose top is hinged to reveal a radio and a turntable that plays 45, 33 1/3 and those old 78 RPM records and features auto-stop. Comes with cartridge and needle installed. What a great addition to the rec room, Den, bedroom or office. It's so simple to operate. Forget the complicated systems of recent vintage. UL listed for safety and includes Crosleys' standard 90 day limited warranty. Measures 16.5" x 6" x 11". THE CR-51 HAS RETURNED FOR A LIMITED TIME! This model was originally produced in 1951. Like the original, this replica boasts big-set reception and full, rich volume. Decorator designed cabinet with AM/FM radio and cassette player with large tuning arrow, dual control knobs and perforated metal grill. Our experience here at Oak Tree, is that these models have above average tuner quality, over many of the her models. Available in Black. 90 Day limited warranty. UL listed. Dimensions 12 1/2"w x 6"h x 7 1/4"d 7 lbs unpacked. This model was originally produced in 1951. Like the original, this replica boasts big-set reception and full, rich volume. 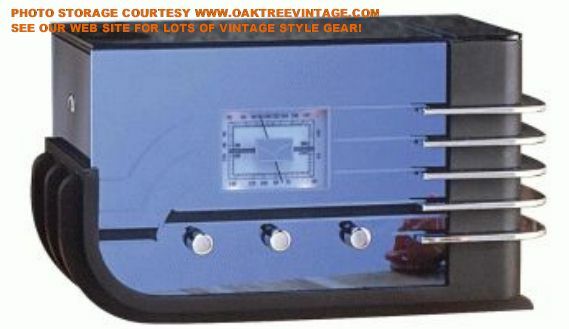 Decorator designed cabinet with AM/FM radio and cassette player with large tuning arrow, dual control knobs and perforated metal grill. 90 Day limited warranty. UL listed. Dimensions 12 1/2"w x 6"h x 7 1/4"d 7 lbs unpacked. 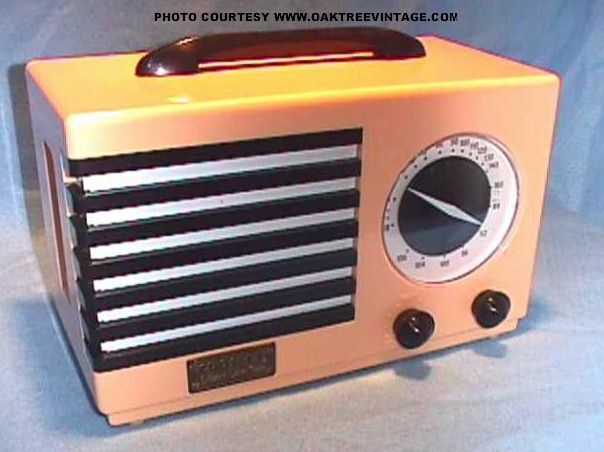 The "COLORADIO" was originally produced in 1951 in six different colors to mix or match the decor of any room in the home. 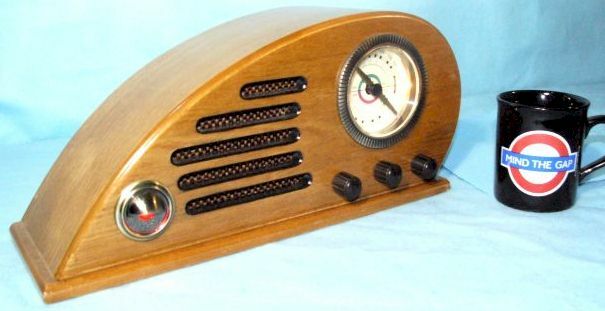 The unique face, with the full-function analog clock (n alarm clock radio) opposite the high-fidelity speaker, gave rise the radios popular nickname, the "Dashboard Radio". Like the original, this replica boasts big-set reception and full, rich volume. Decorator designed cabinet with AM/FM radio and cassette player with large tuning arrow, dual control knobs and perforated metal grill. Side mounted Cassette Deck. Incredible reception! This thing has a GREAT TUNER section. 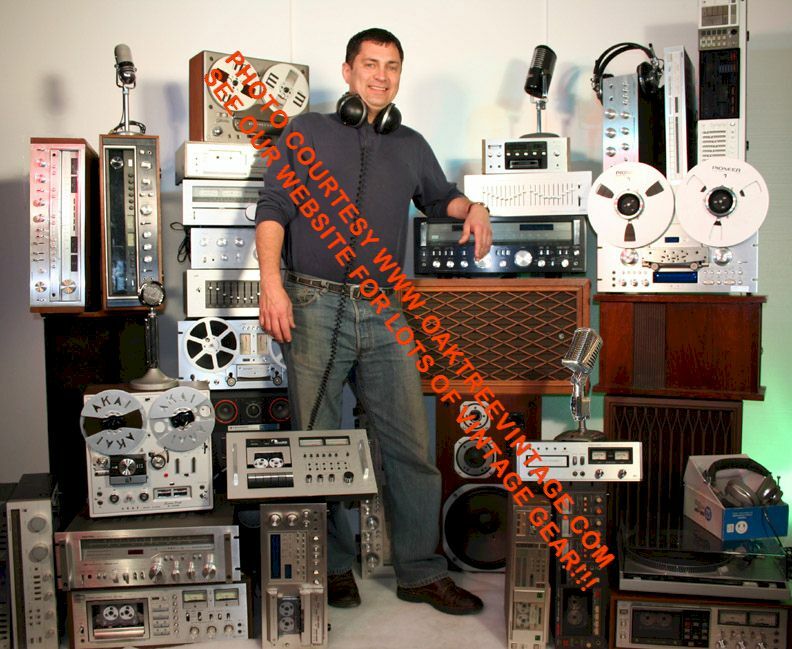 It is one of the best receiving radios we have ever heard on bh FM and AM bands!!! 90 Day limited warranty. UL listed. Dimensions 12 1/2"w x 6"h x 7 1/4"d 7 lbs unpacked. 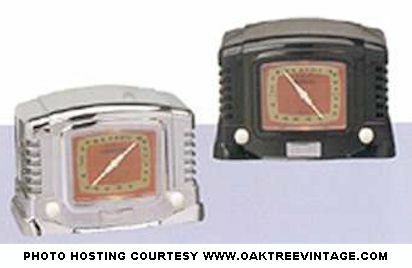 The "COLORADIO" was originally produced in 1951 in six different colors to mix or match the decor of any room in the home. 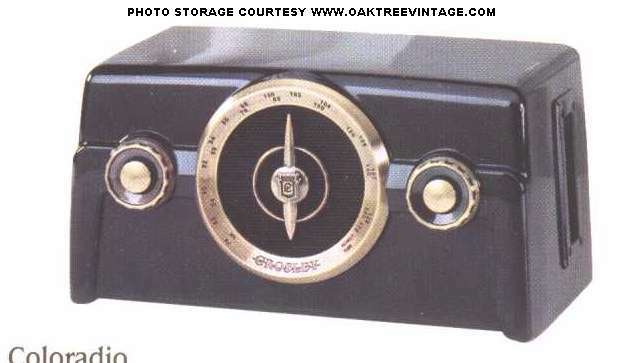 The unique face, with the full-function analog clock (n alarm clock radio) opposite the high-fidelity speaker, gave rise the radios popular nickname, the "Dashboard Radio". Like the original, this replica boasts big-set reception and full, rich volume. Decorator designed cabinet with AM/FM radio and cassette player with large tuning arrow, dual control knobs and perforated metal grill. Side mounted Cassette Deck. Incredible reception! This thing has a GREAT TUNER section. It is one of the best receiving radios we have ever heard on bh FM and AM bands!!! Available in Black. 90 Day limited warranty. UL listed. Dimensions 12 1/2"w x 6"h x 7 1/4"d 7 lbs unpacked. Antique reproduction radio / record player for sale. 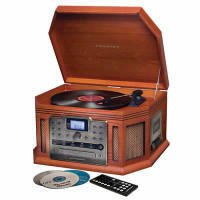 Listen to your favorite songs on LPs, cassettes or radio with the 1940's era Crosley self-contained turntable system. Handcrafted with real Oak Wood veneers in a high-gloss, hand-rubbed finish. 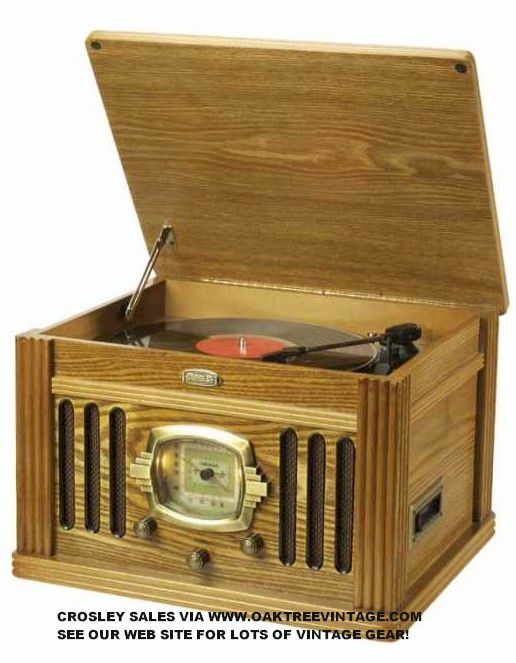 The top is hinged to reveal a turntable that plays 45, 33 1/3 and those old 78 RPM records and features auto-stop. Comes with cartridge and needle installed. Large broadcast dial tunes in your favorite AM or FM stations, and side mounted low profile cassette player features fast forward. Available in Oak. 90 Day limited warranty. UL listed. Dimensions 11"h x 17.5"w x 14.25"d 22 lbs unpacked. THIS MODEL BACK FOR A VERY LIMITED TIME. SPECIAL SALE @ HALF PRICE! Mission style furniture derived its origins from a desire to create furniture and accessories that were pure in form and simple to no ornamentation. The mission movement, which began in the early 1900's, was in response to the heavily gilded and carved Victorian styles. Unlike it predecessor, the mission statement stressed the importance of preserving the simplistic nature of hand crafted products. Expertly combining form and function, the mission style is one characterized by natural, unpainted woods and other earthy materials. It leaves no room for confusion between its stylings and those characteristic of insignificant clutter. This style rose to popularity when architects such as Frank Lloyd Wright adopted the style and the simplistic way of thinking. For more than 70 years, Wright showed his countrymen new ways to build their homes and to see the world around them. This arts and crafts movement is beautifully embodied in Crosley's Mission Stack-O-Matic. Handsomely showcased in a solid wood and veneer cabinet, the Mission stays true to the simplistic nature of design with smooth straight lines and rich edges. 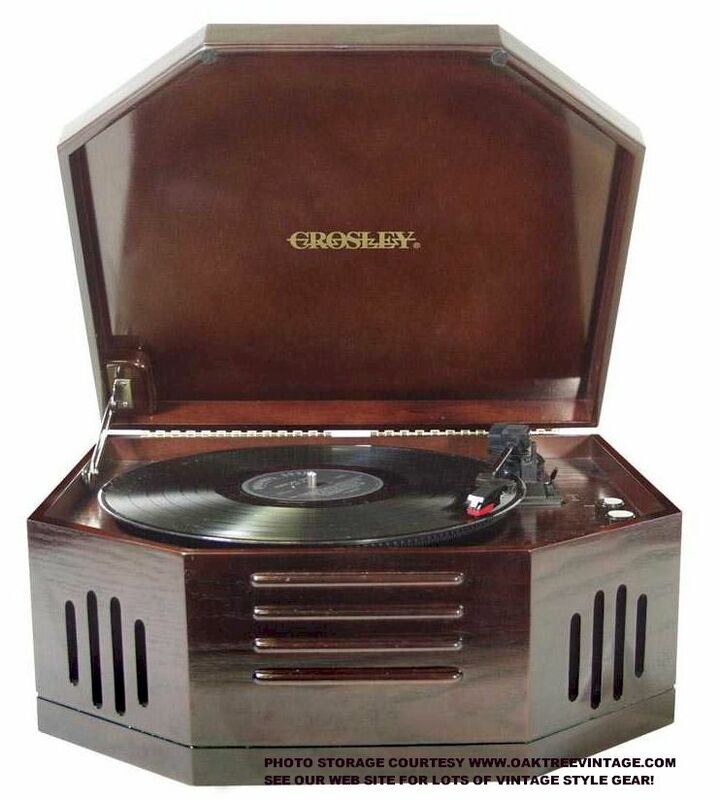 Crosley has married subtle styling's with modern technology. The Mission features Crosley's very own 'Stack-O-Matic�' technology allowing you stack up to 6* records and drop them automatically for continuous play. Let the AM/FM 'True Analog' radio and illuminated, 'Air Plane' dial take you for a stroll down memory lane or just pop in your favorite CD in the front loading CD player for maximum listening enjoyment. Note: We do not recommend stacking 78's because of the age and thickness of them. Let your hair hang down and enjoy the music! 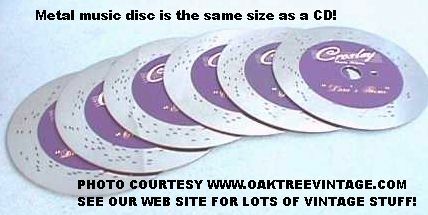 *(stacks up to 6 records at a time, however as we all remember some records 'stacked' better than others. Records made prior to the late 1970's tend to 'drop' better than later ones due to larger center holes on the earlier pressings. Typically 3 is about the norm). Note: We do not recommend stacking 78's because of the age and thickness of them. Replaceable 'Diamond' Record Player Needle / Stylus; Some will use the NS-1 and some will use the NP-1 needle. This a great unit that does all of the above, has the 'Antique / Vintage' look and is a bit more 'substantial' in stature than many of the other models. If you want the ability to 'Stack' and play your old records, play cassette tapes, listen to CD's, and tune in AM/FM radio stations, then this may likely be your ticket. And you can connect your Hi-Fi speakers as well! Now comes with a 1 YEAR limited warranty up from their previous, 90 Day limited warranty. Dimensions: 19"w x 10"h x 17"d & ~19lbs unpacked. 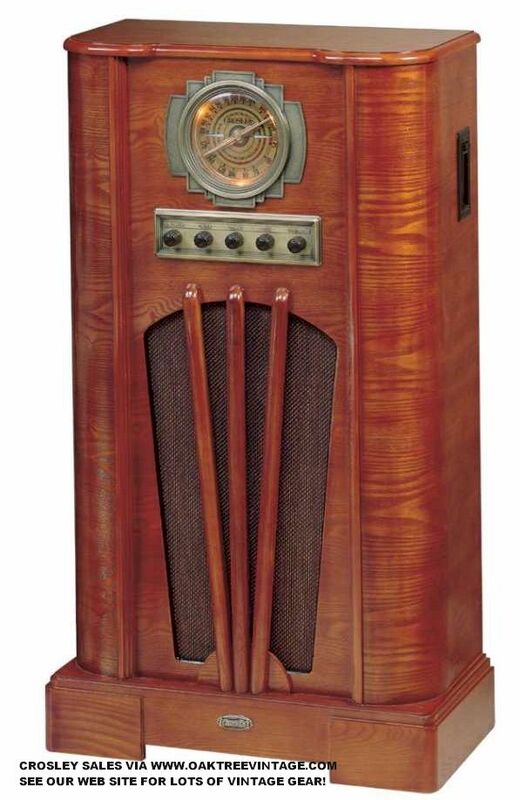 Great looking "Tombstone" style radio. 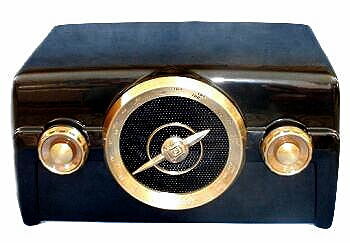 These were design alternatives to the her classic 30's radio the "Cathedral". This one features a detailed "Aircraft" style, back-lit front dial window for AM / FM tuning and a CD player under the top hinged lid. Very nice sound for a table top unit! Beautiful hand-rubbed "Paprika" wood finish cabinet will fit most decors! Unit measures 11 1/2"h (19" open) x 10"w x 9 1/2"d and weighs 22 lbs unpacked. UL listed for safety and includes Crosleys' standard 90 day limited warranty. 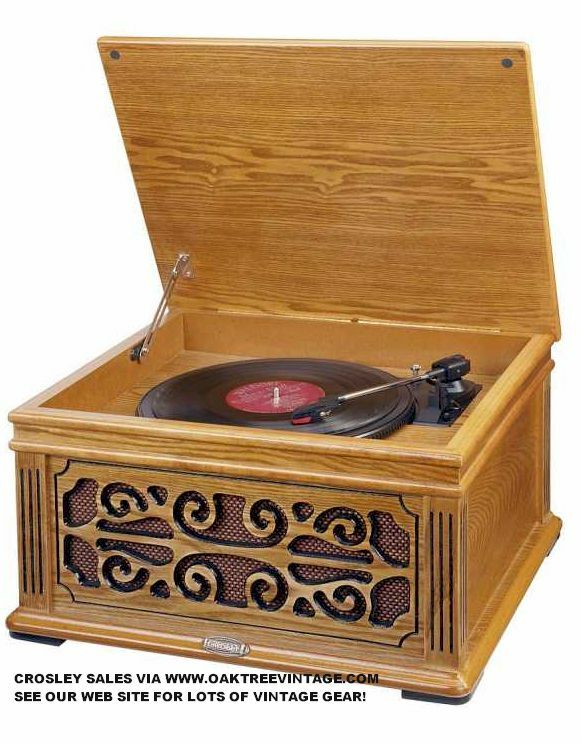 Beautiful Real Oak Wood veneer carved style cabinet features a front mounted full function CD player and the top is hinged to reveal a turntable that plays 45, 33 1/3 and those old 78 RPM records and features auto-stop. Comes with cartridge and needle installed. What a great addition to the rec room, Den or office. It's so simple to operate. Forget the complicated systems of recent vintage. You won't be disappointed. Available in Oak (as pictured) or Paprika. UL listed for safety and includes Crosleys' standard 90 day limited warranty. Measures 21" x 17" x 13" & weighs 24 lbs packed. Features AM / FM digital radio, CD player & Turntable with a side mounted cassette tape player. The front panel in addition to the radio has a full function CD player. There is even a pre-programmed 5-preset EQ set for Flat, Rock, Jazz, POP and Classical music built-in. 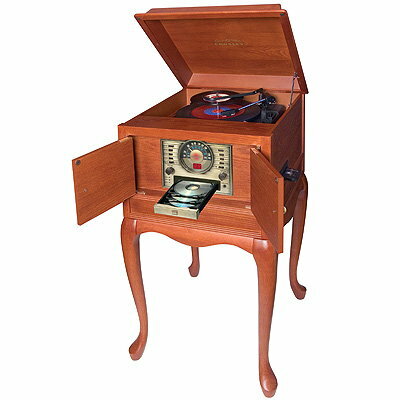 The top is hinged to reveal a turntable that plays 45, 33 1/3 and those old 78 RPM records and features auto-stop. Comes with cartridge and needle installed. What a great addition to the rec room, Den or office. It's so simple to operate. Forget the complicated systems of recent vintage. Includes a full function wireless reme control that operates power On / Off, Instant volume Mute, Volume Up-Down, Function select from Phono-Tape-AM-FM or CD player, Tuner / CD track presets, EQ settings, CD functions, CD repeat, CD / Tuner memory & Tuner scan! Also features a pair of external speaker output jacks (for use with internal speakers or external 8 Ohm speakers). Very well constructed with a beautiful finish! This model has a much better and quiet power supply than last years & a better sounding turntable! Your choice of Beautiful Paprika, Cherry or Oak wood veneer style cabinet. UL listed for safety and includes Crosleys' standard 90 day limited warranty. Measures 17.75" wide x 14.5" deep x 9.5" high ( 20.5" open) unpacked & 23" x 17" x 13" & weighs 28 lbs packed. W/ CD PLAYER AND WIRELESS REME NOW! 4-in-1 Crosley Entertainment Center. This thing is LOADED! 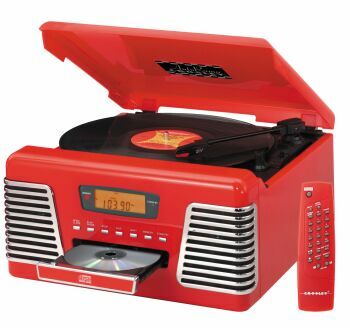 Features AM / FM digital stereo- radio, CD player & Manual Turntable with a side mounted cassette tape player that now RECORDS! Let's you archive those old 78's, 45's and LP's to cassette and put your records away for safe keeping. Click here for a link to the spec sheet & photos of reme for this unit. The front panel in addition to the radio has a full function CD player. There is even a pre-programmed 5-preset EQ set for Flat, Rock, Jazz, POP and Classical music built-in. The top is hinged to reveal a belt-drive, manual turntable that plays 45, 33 1/3 and those old 78 RPM records and features auto-stop. Comes with cartridge and needle installed. What a great addition to the rec room, Den or office. It's so simple to operate. Forget the complicated systems of recent vintage. Includes a full function wireless reme control that operates power On / Off, Instant volume Mute, Volume Up-Down, Function select from Phono-Tape-AM-FM or CD player, Tuner / CD track presets, EQ settings, CD functions, CD repeat, CD / Tuner memory & Tuner scan! 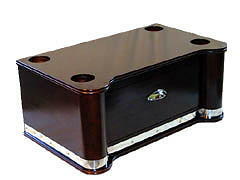 Also features a pair of external speaker output jacks (for use with internal speakers or external 8 Ohm speakers) (see our Hi-Fi speakers page for some great speaker possibilities to add to this unit for super sound: http://oaktreevintage.com/Stereo_Speakers.htm . Very well constructed with a beautiful finish! This model has a much better and quiet power supply than last years & a better sounding turntable! Your choice of Beautiful Cherry, Paprika or Oak wood veneer style cabinet. UL listed for safety and includes Crosleys' standard 90 day limited warranty. Measures 19.5" wide x 14.5" deep x 9.5" high ( 20.5" open) unpacked & 23" x 17" x 13" & weighs 28 lbs packed. 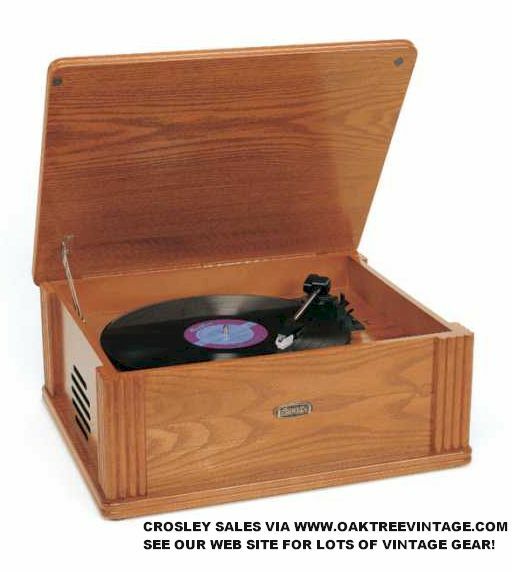 When Powel Crosley built that first radio set for his son, record players let alone record changers were not even an idea. 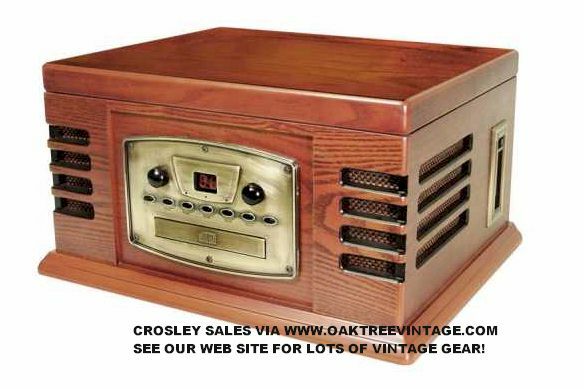 Here we are 80 years later, and the Crosley Arlington Stack-O-Matic� features not only an AM/FM radio, but also Crosley's very own Stack-O-Matic� technology. True to original Crosley stylings, the Arlington Stack-O-Matic� Entertainment Center features a hand rubbed wood veneer cabinet, woven grill cloth corners and quality components that only Crosley can deliver. Crosley's Stack-O-Matic� technology ensures you will once again be able to enjoy your favorite hits uninterrupted, one after another. With a fully automatic swinging motion, the arm reaches the stack and marvelously drops your next favorite album gracefully on the platter. Experience the soft crackle as you gently lay the needle down on your favorite vinyl that's been buried in the attic for decades. And while careful attention to original details lends an air of authenticity, modern technologies add the perfect finishing touch. 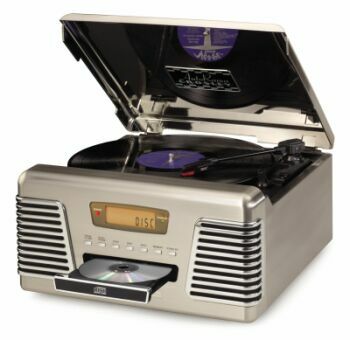 The Crosley Arlington Stack-O-Matic� comes complete with an AM/FM radio, programmable CD player, and a cassette tape player. Let the AM/FM 'True Analog' radio and illuminated, 'Air Plane' dial take you for a stroll down memory lane or just pop in your favorite CD in the front loading CD player for maximum listening enjoyment. This is about the most 'LOADED' of the Crosley units. This a great unit that does all of the above, has the 1940's 'Vintage' look and is a bit more 'substantial' in stature than many of the other models. If you want the ability to 'Stack' play cassette tapes, listen to CD's, and tune in AM/FM radio stations, listen to your iGadget thru it, and have the ability to connect your existing speakers or to connect it to your existing stereo system, then this may likely be your ticket. And you can connect your Hi-Fi speakers as well! Now comes with a 1 YEAR limited warranty up from their previous, 90 Day limited warranty. Dimensions: 19"w x 9.5"h x 15.75"d & ~23lbs unpacked. The CR-86, �BandMaster� features Crosley's very own Stack-O-Matic� turntable Technology allowing you to stack up to 6 records and drop them automatically for continuous play. These are a great way to get a changer type turntable without needing an existing stereo system for connection. 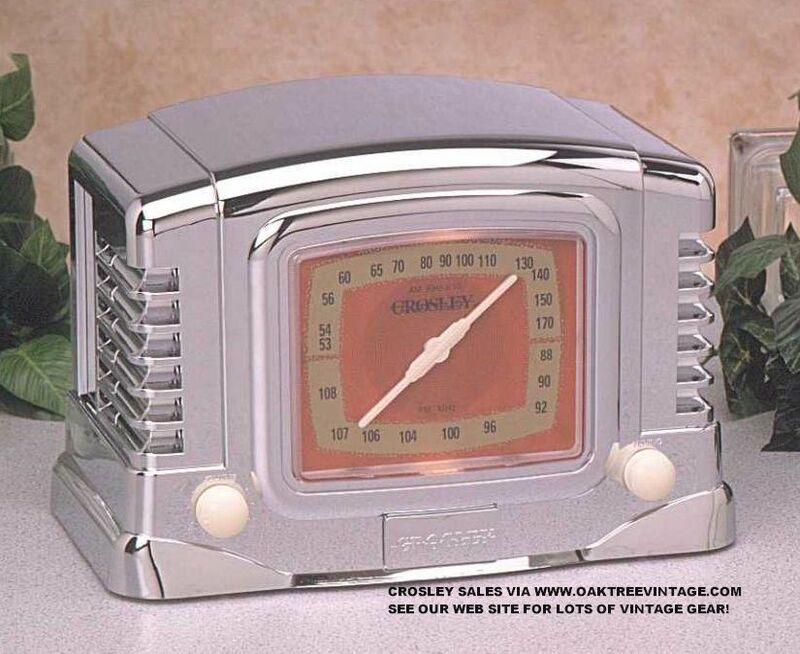 The analog AM/FM radio has a handsome illuminated �Speed-O-Meter� style, center dial, while a dose of modern-day-technology includes a programmable CD Player with 20-track memory. The finish is real Oak wood veneer with a satin Paprika finish. 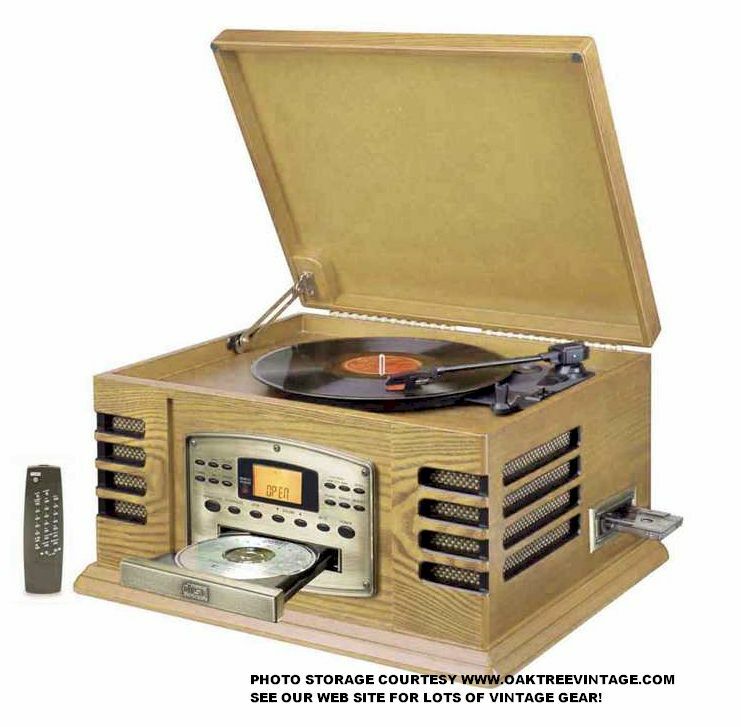 The top is hinged to reveal a turntable that plays 45, 33 1/3 and those old 78 RPM records and features auto-stop. Comes with cartridge and needle installed. Large broadcast dial tunes in your favorite AM or FM stations. Available in Paprika finish. 90 Day limited warranty. UL listed. Dimensions 10"h x 18.25"w x 16"d 22 lbs unpacked. Comes with free extra needle / stylus for record player! Ne: We do n recommend stacking 78's because of the age and thickness of them. Also stacking 45�s is also a bit �dicey� as the centering disc sometime pops out of the record. Stacking older LP�s from the mid 70�s and back, works better than some of the later made records as the center holes on later records are smaller and sometimes hang up on stacking mechanisms. fantastic sound quality, offers little in the way of decorative value to any interior design. Crosley's Queen Anne "Stack-O-Matic" � Console fills that void. Perfect for the living room or den, where the surround sound doesn't reach, this Queen Anne styled unit has it all. The unit is high-quality constructed and finished in a deep hand-rubbed Paprika. 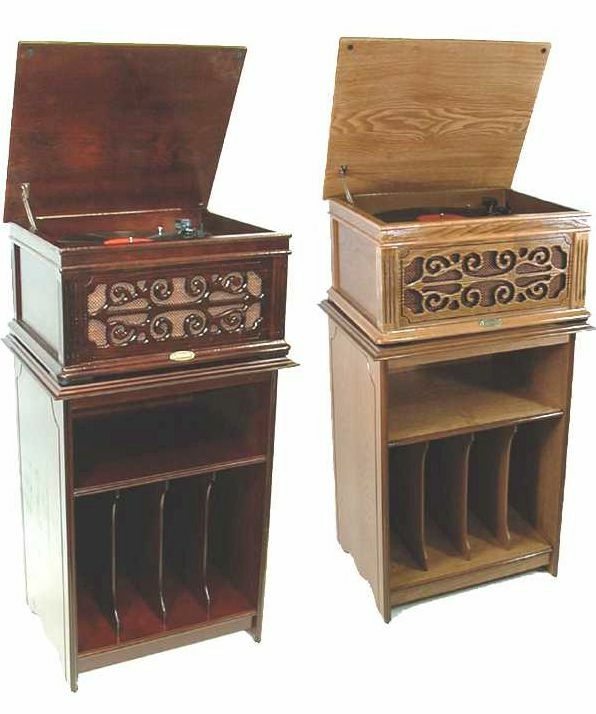 The top is hinged to reveal a turntable that plays 45, 33 1/3 and those old 78 RPM records and features a changer / stacker with fully-automatic operation. Comes with the integrated cartridge and replaceable needle installed. Open the front doors to find a 3-disc, CD player / changer with search and program features, and there's also and AM / FM receiver. There's even a cassette tape player on the side! This unit features a self-contained amplifier and Full-Range stereo speakers. AM / FM - CASSETTE / CD / RECORD PLAYER!!! Great "Retro" 50's style cabinetry, reminiscent of the great "Heywood Wakefield" era. 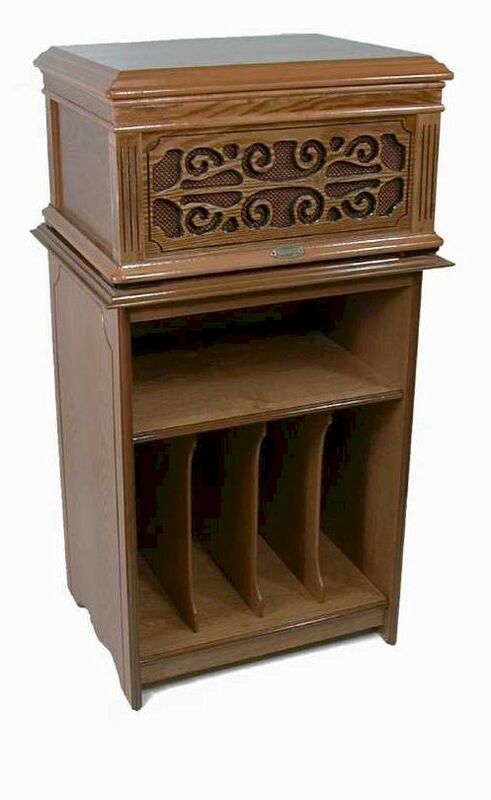 The Guv'nor Entertainment Center from Crosley Radio. Perfect for the living room or den, The Guv'nor is constructed of Real Wood Veneer, over Hi-Density board and finished in a deep hand-rubbed Oak that is brought to brilliance with a 7-step furniture finishing process. 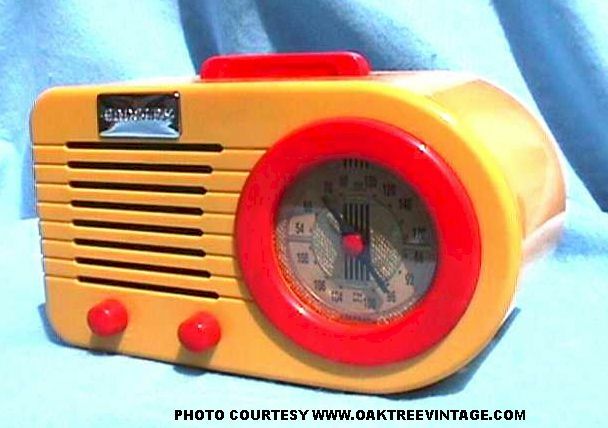 The front panel features an analog AM/FM radio with old-fashioned tuning dial, a compact disc player complete with search and program features, and there's even a cassette player on the side. As if that weren't enough, a 3-speed turntable is discreetly featured under the hinge top lid. This is a great alternative to our "Queen Anne" look, but still in a free-standing stereo with record player. 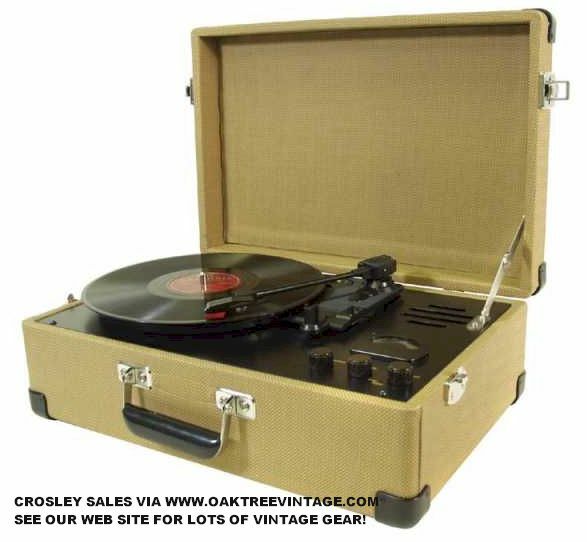 Again, this is one of the "coolest" of the Crosley designs. Gta love those external speaker outputs as well for connecting to her speakers. 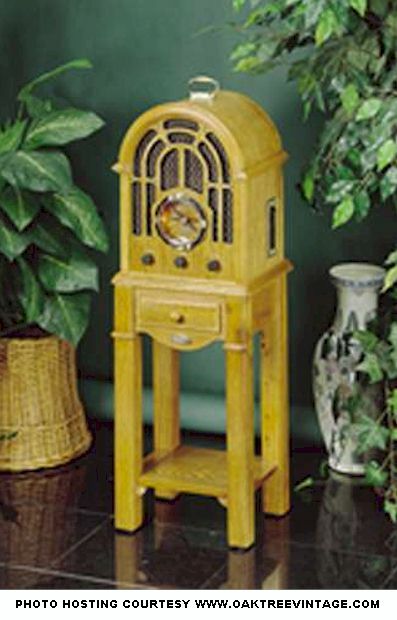 Beautiful late 20's "Victrola" style AM-FM Digital Radio / Turntable / CD player with a wireless reme control! Looks like an old wax cylinder player. Paprika finish wood cabinet opens up in the front to reveal AM / FM Radio / Side mounted Cassette Deck / CD player and a top mounted turntable that plays bh 45 and 33 1/3 RPM records and features auto-stop. Comes with cartridge and needle installed. Also includes Wireless Reme Control. UL listed for safety and includes Crosleys' standard 90 day limited warranty. Measures 22" x 20" x 24" & weighs 38 lbs packed. Mini-version of CR37, 1930's Blue Bird Replica, this is one of the most celebrated Art Deco "STEEL-BLUE MIRROR" radios ever produced. This exceptional recreation is designed, engineered, and crafted by hand. The 8" diameter "Steel" blue mirror slants back as originally inspired and is accentuated by chrome feet and three horizontal accent bars. AM/FM radio only. Dimensions 8"W X 8"H X 4"D 4 lbs unpacked. 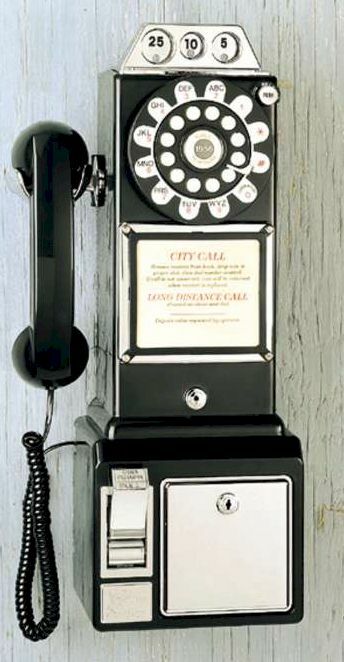 The crank handle actually turns on this classic phone first introduced in the 1920's, but today's replica features touch-tone buttons with a rary look. The handcrafted Oak wood veneer cabinet is enhanced with brass-plated hardware and has a storage compartment under the desk lid. Phone has volume controls for ringer and receiver, modern US phone jack hook-up and is tone/pulse switch-able. Also features Last Number Re-dial by pushing center medallion of dial face. Dimensions approx. 9"w x 17 1/2"h x 7"d 6 lbs. 90 Day limited warranty. 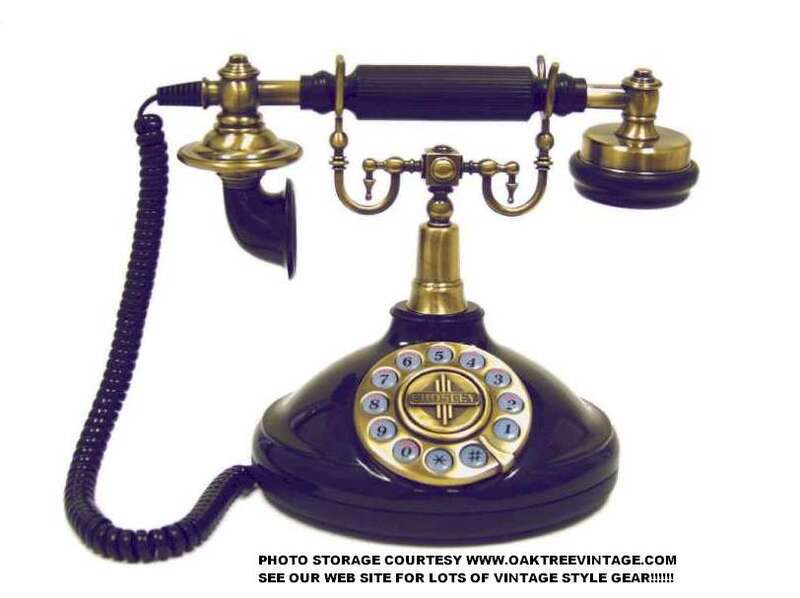 This 1920's replica of famous European design phone is constructed of solid woods and veneers with a cherry finish. Elegantly designed with nickel'd brass hardware with wood hand piece and 44" cloth cord. 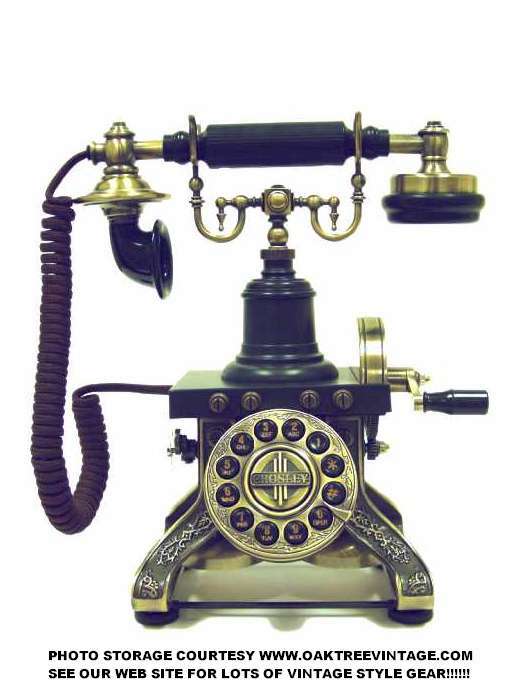 The rotary look dial has a modern pushbutton keypad, modern US phone jack hook-up and tone/pulse switch with ringer and receiver volume controls. Also features Last Number Redial by pushing on the center medallion. It plugs into a standard US phone jack. Dimensions 7"w X 9"h X 7 "d 5 lbs. (12" x 12" x 11" and 6 lbs pkd). 90 Day limited warranty. NOW DISCONTINUED. DO NOT ORDER AS THERE ARE NO MORE. PERIOD. W/ CD PLAYER / RECORDER AND WIRELESS REMOTE NOW! Do you have stacks and stacks of vinyls collecting dust in your basement, attic or garage? Have you always wished you could transfer them to CD without having to be a techie? No need for special equipment, computers or cables. With the Crosley 'Composer', you can easily record your albums onto CD with the push of a button-- simply put on your LP or pop in a cassette, then load a blank CD and press 'record' ." � Voila! Your valuable record or old tape is on a CD, ready to take on the road. 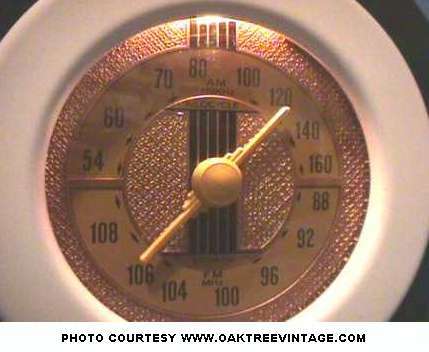 If you still prefer listening to your record 'old style', then fire up the 3-speed (33-1/3, 45 and 78** rpm) record player. In case that's not enough, we've incorporated an AM/FM radio, CD player, cassette player and remote control. The 'Composer' blends real wood veneer, antique style with modern day gadgetry housed in a cabinet too hard to resist. This is essentially the equivalent of the 'Compact Stereo System's' available throughout the '70's and into the '80's that we all had at one time or another, except it now plays and records CD's! 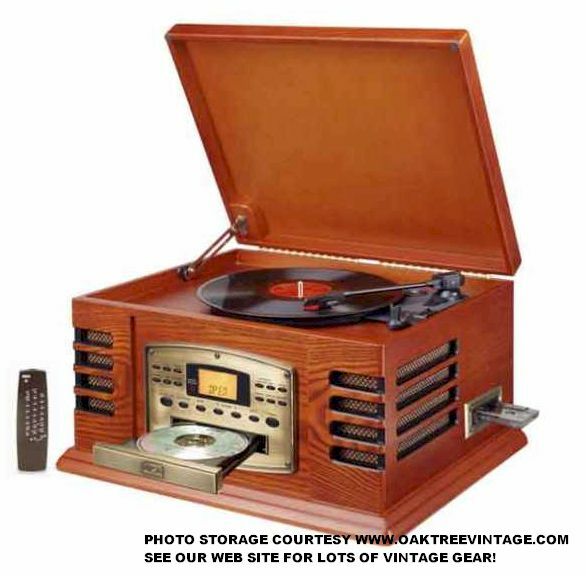 This a great unit that does all of the above, has the 1940's 'vintage' look lets you play your old records and record them to CD, play cassette tapes, listen to CD's, connect your 'iGadget' and tune in AM/FM radio stations, then this may likely be your ticket. And you can connect to your existing Hi-Fi system as well! Now comes with a 1 YEAR limited warranty up from their previous, 90 Day limited warranty. Dimensions: 18.5"w x 10"h x 14.25"d & ~26lbs unpacked. Incredible looking design. Very "technical" in appearance for it's time. Features twenty-first century features such as pulse / tone system select ability, modern US phone jack hook-up, last number redial by pushing center of phone dialer and push-button operation. Details in cast antiqued brass finish metal. Moving hand crank can also ring the brass bells for fun! 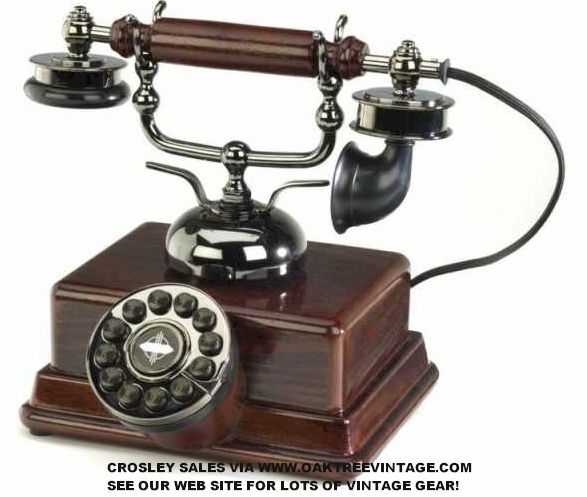 Also features modern style coiled hand-set cord that is clh covered for period authenticity. 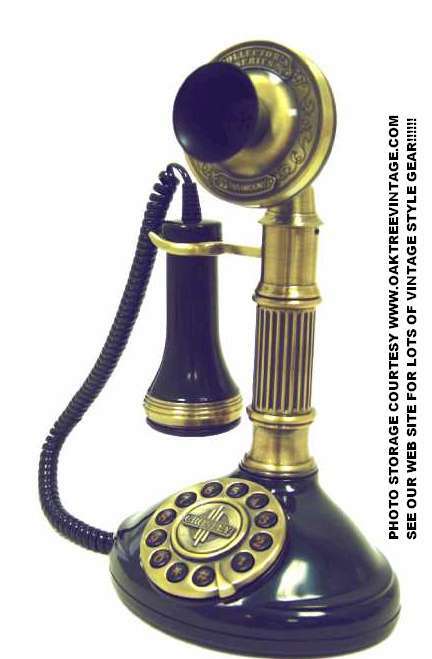 Classic "Candlestick" design phone with stout "Roman" lines. Very "authentic" in appearance! Features twenty-first century features such as pulse / tone system select ability, modern US phone jack hook-up, last number redial by pushing center medallion of phone dialer and push-button operation. her features include handset volume and ringer volume. Very nice antiqued brass finish metal column and details. Approx 11" tall. (14" x 9" x 8" and 6 lbs pkd) 90 Day limited warranty. 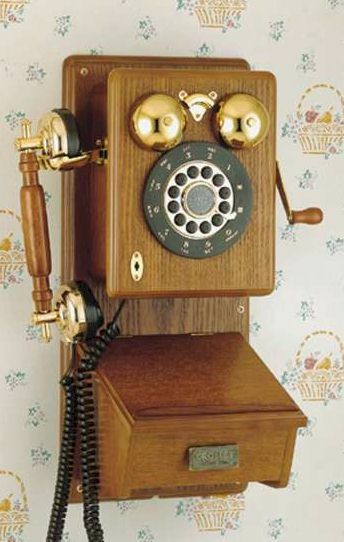 Classic "Candlestick" design phone. Very "authentic" in appearance! Features twenty-first century features such as pulse / tone system select ability, modern US phone jack hook-up, last number redial by pushing center medallion of phone dialer and push-button operation. 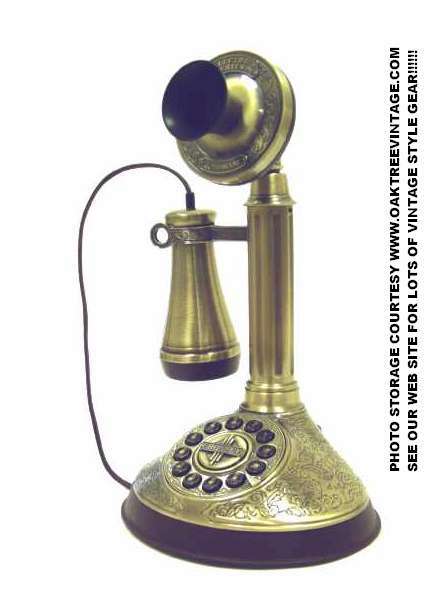 Phone base covered in heavily engraved details in cast antiqued brass finish metal. Also features authentic clh-covered handset cord. Approx 11.75" tall. (14" x 9" x 8" and 6 lbs pkd) 90 Day limited warranty. Very "delicate" design in appearance. A fun phone to use. Features twenty-first century features such as pulse / tone system select ability, modern US phone jack hook-up, last number redial by pushing center medallion of phone dialer and push-button operation. Very nice antiqued brass finish metal details. Approx 9" tall. 90 Day limited warranty. CR-712 WITH CD PLAYER & REME! Mimicking the clean, streamlined styling of a classic 1950's automobile this beauty takes you back to the days of drive-ins and diners. 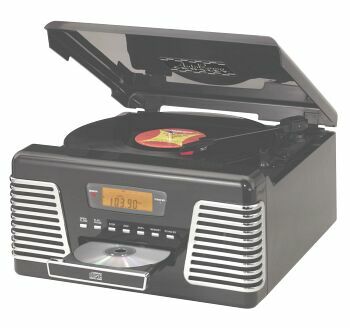 The "Auto-Rama" CD features an AM/FM Radio, a 3 speed turntable, a front loading compact disc player and enough sophistication to render most enthusiasts speechless. Now also comes with wireless reme control! CD version Now also comes with wireless reme control! This beautifully handcrafted external speaker set enhances your jukebox's already wonderful sound quality by providing a truly exceptional sound experience. They serve as the perfect compliment complete with coordinating grill cover and hardwood cabinet. What a COOL piece!!! This is the size of a double-cutaway electric guitar only it's an Alarm clock / AM-FM Stereo Radio / CD player. Even has real guitar strings running up the neck held on with real guitar tuners! (n for really playing of course). Fantastic looking British "Jack" finish! This thing looks great! Hard to tell it's n a real guitar that has been retrofitted. Includes full size guitar stand, wall mount hanger and a full function wireless reme control! Measures approx. 43" high x 15" wide and weighs 22 lbs. 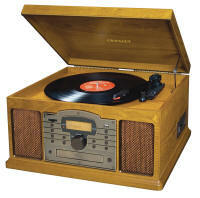 Includes the standard Crosley 90 day limited warranty. COOL! What a COOL piece!!! This is the size of a double-cutaway electric guitar only it's an Alarm clock / AM-FM Stereo Radio / CD player. Even has real guitar strings running up the neck held on with real guitar tuners! (n for really playing of course). Very patriic and will done American Flag finish! What a COOL piece!!! This is the size of a double-cutaway electric guitar only it's an Alarm clock / AM-FM Stereo Radio / CD player. Even has real guitar strings running up the neck held on with real guitar tuners! (n for really playing of course). Great looking and very well done gloss black finish! 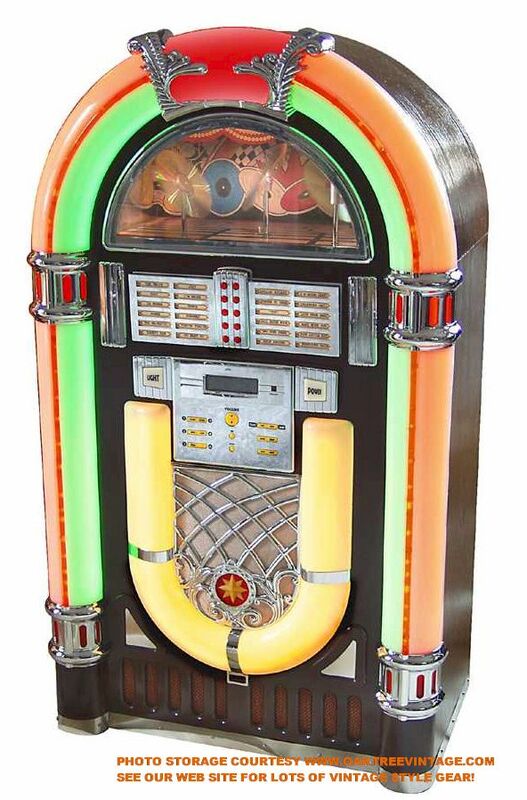 This Crosley 2/3 scale CD Jukebox is the finest replica of the most famous jukebox ever produced, the Wurlitzer 1015. 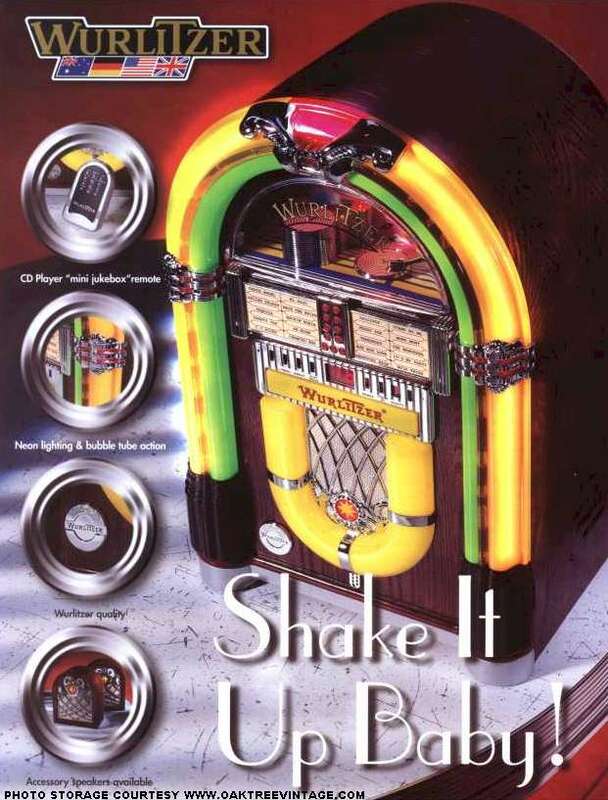 Updated for our times, this jukebox features a state-of-the-art Sanyo 3 compact disc changer, an AM/FM radio, a full function reme control and a 42-disc storage base. 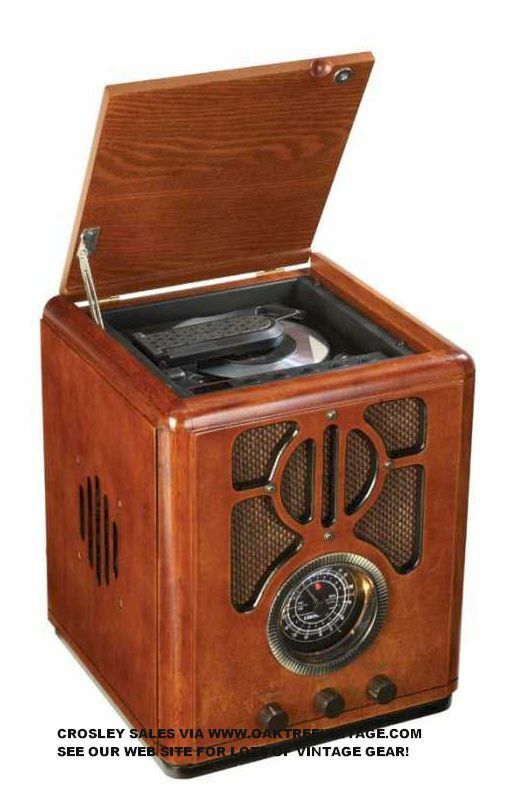 The Crosley Jukebox is also equipped with 4 speakers and 4 transformers and appropriately vented to keep the internal components cool for hours of endless enjoyment. Each unit is individually checked and tested extensively to meet the highest standards of quality workmanship and UL listed. 3-CD changer version also has AUX inputs for external Turntables, Tuners, MP3 players, i-Pods, XM or Sirrus tuners, DVD players, etc. A cluttered coffee table or even the floor is no place for your handsome Crosley turntable and your vinyls. Add some panache to your room with the Corydon Entertainment Center Stand. This crafty stand features all the form and function you would come to expect from Crosley. 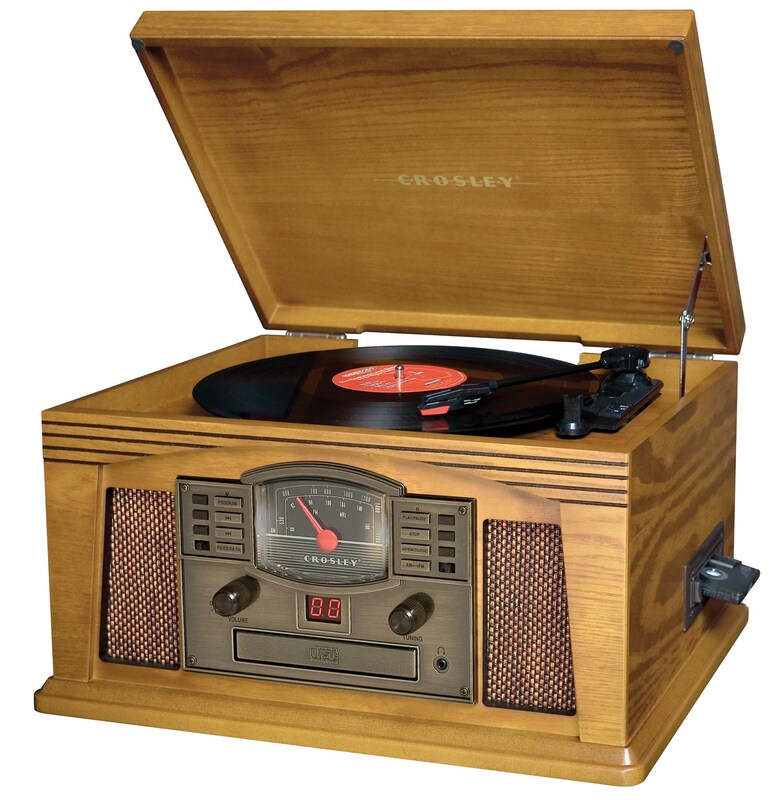 The Corydon is constructed of MDF and real wood veneers in Crosley's signature colors; Cherry, Oak and Paprika. The Corydon comes complete with a wooden shelf for CDs or cassettes and wood dividers for storing your complete record collection. Celebrate the beauty of your Crosley turntable and vinyl collection by complimenting them with the Crosley Danville Entertainment Center Stand. The stand features simple construction yet sophisticated style. 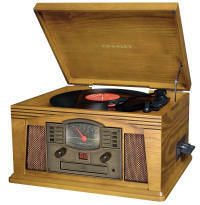 The Danville is constructed of MDF and real wood veneers in classic Crosley finishes such as Cherry, Oak and Paprika. The Danville comes complete with decorative wire record slots for storing your favorite vinyls. Celebrate the beauty of your Crosley turntable and vinyl collection by complimenting them with the Crosley Danville Entertainment Center Stand. 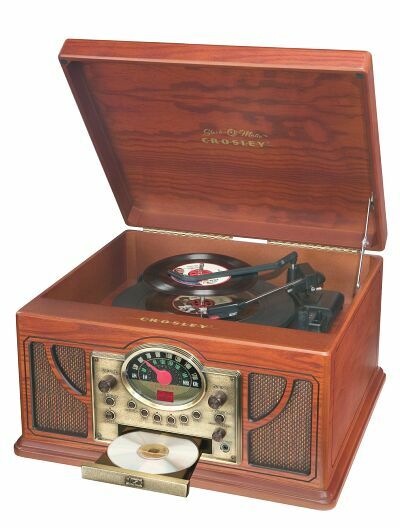 Each Crosley Antique Reproduction Music Box Includes* 6 Metal Music Discs.